cDepartment of Epidemiology and Social Medicine (H.M., K.B. ), University of Münster, Münster, Germany. BACKGROUND AND PURPOSE: Functional MR imaging of the brain, used for both clinical and neuroscientific applications, relies on measuring fluctuations in blood oxygenation. Such measurements are susceptible to noise of vascular origin. The purpose of this study was to assess whether developmental venous anomalies, which are frequently observed normal variants, can bias fMRI measures by appearing as true neural signal. MATERIALS AND METHODS: Large developmental venous anomalies (1 in each of 14 participants) were identified from a large neuroimaging cohort (n = 814). Resting-state fMRI data were decomposed using independent component analysis, a data-driven technique that creates distinct component maps representing aspects of either structured noise or true neural activity. We searched all independent components for maps that exhibited a spatial distribution of their signals following the topography of developmental venous anomalies. RESULTS: Of the 14 developmental venous anomalies identified, 10 were clearly present in 17 fMRI independent components in total. While 9 (52.9%) of these 17 independent components were dominated by venous contributions and 2 (11.8%) by motion artifacts, 2 independent components (11.8%) showed partial neural signal contributions and 5 independent components (29.4%) unambiguously exhibited typical neural signal patterns. CONCLUSIONS: Developmental venous anomalies can strongly resemble neural signal as measured by fMRI. They are thus a potential source of bias in fMRI analyses, especially when present in the cortex. This could impede interpretation of local activity in patients, such as in presurgical mapping. In scientific studies with large samples, developmental venous anomaly confounds could be mainly addressed using independent component analysis–based denoising. Incidental findings and normal variants are frequently encountered in brain MR imaging.22⇓⇓⇓–26 While debates on the management of incidental findings in scientific studies mostly focus on participant safety,27 little is known about potential biases of particular findings on measures of scientific or clinical interest (putative correlates of neural signals) in fMRI. The detectability of DVAs depends largely on the imaging techniques used. However, DVAs are characterized by very typical morphologic imaging features. These are large collector veins crossing the brain parenchyma in locations where usually only capillaries and small veins are expected, and radially contributing veins resulting in a typical caput medusae appearance.29,31 These veins drain blood from an atypical territory. The presence of a DVA thus potentially undermines common assumptions about the origin of observed BOLD signal fluctuations in gray matter regions. The purpose of this study was to assess if and how DVAs bias fMRI measures by assessing the similarity of DVA correlates in rsfMRI to typical patterns of neural activity in a large, community-based imaging population.33 If such similarity exists, then the presence of DVAs might lead to misinterpretations of local activity patterns in presurgical mapping and confound conclusions in group studies and new rsfMRI-based diagnostic approaches. This analysis is based on subjects with large DVAs identified during routine radiologic review and quality assessment of brain MR imaging for the BiDirect cohort study.33,34 They were selected from a mixed sample of patients with depression and population-dwelling controls (n = 814). The study was approved by the local ethics committee, and all subjects gave their written informed consent. Demographic characteristics of the BiDirect cohort and the imaging sample used here are presented in On-line Table 1. The main analyses were based on the following sequences: a 3D T1-weighted gradient-echo sequence with an inversion prepulse—turbo field echo, TR/TE = 7.26/3.56 ms, TI = 404 ms, flip angle = 9°, sagittal orientation, matrix = 256 × 256 mm, field of view = 256 × 256 × 160 mm, voxel size = 1 × 1 × 2 mm reconstructed to 1 × 1 × 1 mm by zero-filling in the k-space; rsfMRI using a T2*-weighted echo-planar imaging technique—fast-field echo, TR/TE = 3000/38 ms, flip angle = 90°, 72 volumes, matrix dimensions = 64 × 64, FOV = 230 × 230 mm, 36 axial slices, thickness = 3.6 mm, pixel size = 3.6 × 3.6 mm. Additional information about DVA morphology was obtained from the following: FLAIR—TR/TE = 11,000/80 ms, TI = 2600 ms, flip angle = 90°, matrix dimensions = 352 × 206, FOV =230 × 186 mm, 27 axial slices, thickness = 4 mm, gap = 1 mm, reconstructed pixel size = 0.45 × 0.45 mm; and a T2*-weighted fast-field echo sequence—TR/TE = 574/16 ms, flip angle = 18°, matrix dimensions = 256 × 164, FOV = 230 × 183 mm, 27 axial slices, thickness = 4 mm, gap = 1 mm, reconstructed pixel size = 0.45 × 0.45 mm. Suspected DVAs were confirmed in a separate step after initial screening during visual data-quality assessment based on T1-weighted images using the following criteria: 1) a large vessel crossing the brain parenchyma, and 2) a typical caput medusae appearance of feeding vessels. Finally, a typical hypointense appearance was confirmed on T2* fast-field echo. We excluded subjects with signs of other associated vascular lesions, for example, cavernous malformations. FLAIR images were inspected for surrounding hyperintensity as a potential sign of venous congestion.32 Demographic information about all subjects selected for the DVA analysis as well as DVA locations is presented in On-line Table 2. Two types of components representing venous signal fluctuations are particularly relevant for DVAs: those showing mainly the venous sinuses and large veins and those putatively representing transmedullary and subependymal veins (traditionally referred to as white matter components). Given the partially venous origin of the BOLD signal of interest, venous noise components can exhibit temporal characteristics that greatly resemble signal components.36 Thus, additional spatial features (eg, based on sinus masks) have to be used in automatic noise-classification tools,37 but the underlying spatial assumptions behind these predefined masks could be broken in the presence of a large DVA. Sixteen DVAs without an associated second vascular lesion were identified in 16 subjects. None of the DVAs exhibited associated hyperintensities on FLAIR, kinking of the draining vein, or other indirect signs of venous congestion. Two of these findings located in the cerebellum were excluded from further analyses because they were partially cut by the fMRI acquisition volume. All of the 14 DVAs subsequently included were present in at least 1 IC. Ten DVAs (71.4%) had unique local presence, closely following their spatial distribution in at least 1 IC per subject and up to 4 ICs per subject. The remaining 4 DVAs had less specific spatial coverage. In other words, it could not be determined whether alterations in ICs corresponding to these 4 DVAs (at least 1 IC per subject) were directly related to the DVA or whether these alterations represented signal fluctuations of interest in the surrounding tissue or other sources of noise. In total, 43 ICs thus covered spatial locations specific to DVAs across subjects. Seventeen of these ICs (39.5%) exhibited unique contributions following the spatial distribution of the DVAs, while a further 26 ICs (60.5%) were less specific, with their spatial distribution only partially overlapping that of the DVAs. 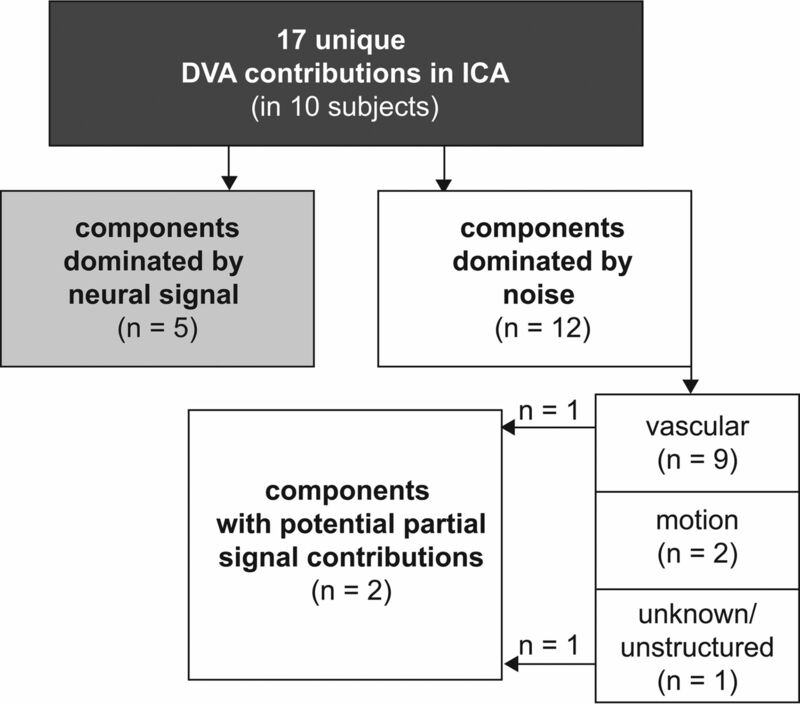 Among the 17 ICs closely following the spatial distribution of the DVAs, 9 (52.9%) were ICs with predominantly vascular patterns and clear contributions of venous sinuses, deep cerebral veins, or subependymal veins (white matter components), one of which exhibited partial signal contribution. Two ICs (11.8%) were dominated by motion artifacts. Most important, 5 ICs (29.4%) in 3 subjects exhibited dominant patterns typical of true neural signal. Three of these 5 ICs had clean low-frequency power spectra, while contamination in the higher frequency range was present in 2 ICs. One final IC was unstructured in its overall spatial distribution but showed partial overlap with neural signal (see Fig 1 for an overview of these results). Overview of dominant effects represented by the independent components which included unique contributions of DVAs. Illustrative cases are presented in Figs 2 and 3. A full list of the sample including DVA-related findings is presented in On-line Table 2. All 17 ICs distinctly following the spatial distribution of the DVAs are presented in On-line Figs 1–10. An example of a unique contribution of a DVA with deep drainage in an IC dominated by venous pulsations (subject 5). Typical anatomic features of the DVA (arrow, A) with a caput medusae appearance, unique contribution following the course of the DVA through the parenchyma (arrow, B) and contributions attributable to normal subependymal veins in the periventricular white matter (asterisk, B). C, Midsagittal view representing the typical venous character of this component, including venous sinuses and deep veins. An example of a unique contribution of a DVA (arrows) in an IC exhibiting typical characteristics of a neural signal component (subject 3). In summary, most DVAs clearly appeared in ≥1 component on the basis of ICA decomposition of the rsfMRI data. While some of these ICs demonstrated unambiguous venous ICs including the venous sinuses, some of the DVAs were present in ICs that mostly exhibited typical features of neural signal ICs or that could not be unambiguously classified as noise. These findings show that signal fluctuations in DVAs can contribute to the fMRI signal in the brain and thus have the potential to bias conclusions in both clinical and scientific fMRI analyses if not appropriately considered, especially in a superficial/cortical location. DVAs could thus lead to pseudoactivations in presurgical mapping, biasing the possible extent of subsequent tumor resection if not recognized. Local pseudoactivity might also bias conclusions in the rsfMRI group studies, focusing on disease mechanisms, particularly in small samples. Finally, altered activity patterns may lead to false individual diagnostic decisions in highly automated diagnostic modeling, for example, when a classifier (supervised learning) is applied to rsfMRI data biased by a DVA in a single subject. In addition to identification of interpretable signal components,36 ICA has a practical application for reduction of such biases. Indeed, it can be used to separate signals of interest from noise in fMRI data based on either hand classification of ICs36,54 or by using automated IC classification tools.36,37,55⇓⇓⇓⇓⇓⇓⇓⇓⇓–65 Our results suggest that biasing signal fluctuations in DVAs can not only be identified but also addressed by ICA-based denoising in most cases. However, our results also demonstrate that a non-negligible proportion of DVAs cannot be reasonably separated from the neural signal of interest and may contaminate clear signal ICs, as well as unclear ICs (which are typically not removed from the dataset with these cleaning methods). The co-occurrence of DVA signal and typical neural signal patterns might be mainly based on similarly low (and potentially aliased) frequencies of the BOLD signal fluctuations in the temporal domain. We therefore believe that this observation points to the typical problem that the indirect measurement of neural activity by BOLD fMRI can be confounded by vascular sources of noise.55 In our opinion, this aspect is underappreciated in many fMRI and particularly rsfMRI studies, and both researchers and clinical personnel should be more aware of this general issue. Another practically important finding is that the significant signal alterations related to DVAs strictly followed the spatial distribution of the collecting vein and large tributaries. This finding supports the idea that a potential bias is relatively local, though subthreshold alterations in the immediate vicinity cannot be excluded. This analysis focused on large DVAs clearly identifiable by their typical branching morphology (ie, no hard size criterion). Because 3D susceptibility-weighted imaging or contrast-enhanced T1-weighted data were not available in this sample, the true DVA prevalence is probably underestimated. Thus, the sample size of 14 subjects with clear DVAs in this study is comparatively small. In particular, DVAs with a superficial drainage pattern were potentially underrepresented because they can be more difficult to identify by nonenhanced MR imaging. We expect superficial DVAs to be more problematic, even if smaller, because the spatial interpretation of the signal origin (cortex versus DVA) is more difficult in these cases. Because we did not observe rare DVAs with signs of venous congestion in our substantial cohort of 814 participants, we unfortunately could not assess how rsfMRI captures this clinically relevant information. While focusing on ICA outputs might be perceived at first as a limitation, this analysis method actually provides an unbiased way to assess the true characteristics of the DVA signal and therefore its potential bias. This work provides a proof of concept that DVAs can have features very similar to those of neural signal patterns and can thus potentially be a source of bias in fMRI analyses, probably especially when present in a superficial location involving the cortex. Thus, our study raises awareness of a potential issue that has been neglected so far. Although most effects of DVAs on fMRI signal were local and potentially amenable to dedicated noise-correction methods, there is evidence of more widespread alterations and a contamination of putative neural signal. In the clinical setting, physicians should be aware of potential “pseudoactivations” caused by DVAs, especially in the context of presurgical mapping, as well as potential biases these could cause in highly automated diagnostic approaches using supervised learning16⇓⇓–19 in big data and genome-wide association studies.20 DVAs in brain regions of interest could bias conclusions in small-group studies and thus warrant exclusion on a case-by-case basis. Even though DVAs are usually not a clinically relevant finding, they should thus be reported to researchers by radiologists or neuroradiologists involved in the routine evaluation of scientific MR images of the brain. Awareness of potential biases caused by these frequent normal variants is important not only for neuroscientists but also for correct interpretation of clinical fMRI data. The authors thank all study participants and the entire team of the BiDirect study, including collaborators in associated institutions. Disclosures: Benedikt Sundermann—RELATED: Grant: Deutsche Forschungsgemeinschaft, Comments: research fellowship SU 917/1–1. Heike Minnerup—RELATED: Grant: German Federal Ministry of Education and Research, Comments: grants 01ER1205, 01ER0816, and 01ER1506. * Klaus Berger—RELATED: Grant: German Ministry of Research and Education. * *Money paid to the institution. B.S. was funded by a research fellowship from the Deutsche Forschungsgemeinschaft (SU 917/1-1). BiDirect is funded by a research grant (01ER0816 and 01ER1506) from the German Federal Ministry of Education and Research. H.M. was funded by a German Federal Ministry of Education and Research grant (01ER1205). G.D. was supported by the UK Medical Research Council (MR/K006673/1). Preliminary results of this work previously presented at: Annual Meeting of the European Society of Neuroradiology, September 13–17, 2017; Malmö, Sweden.
. Automatic choice of dimensionality for PCA: technical report 514. MIT Media Lab Vision and Modeling Group. 2000. https://tminka.github.io/papers/pca/minka-pca.pdf. Accessed April 12, 2017. Accepted after revision August 25, 2018.